Are you experiencing ringing in your ears? Are you having to turn up the volume of your TV and your phone and find yourself wishing you could control the volume of everything? Do you experience episodes of ‘dizziness’ for what seems like no particular reason? Did you know that the ringing in your ears could be the result of some for of hearing loss? You may be experiencing a type of hearing loss, tinnitus or vertigo. Stop wondering what is affecting your quality of life and talk to your local audiologist. The most common symptom of tinnitus is ringing in your ears. At the very least the ringing is annoying, making it difficult to hear everyday sounds. Severe tinnitus can get noisy enough to interrupt your sleep and cause dizziness and nausea. 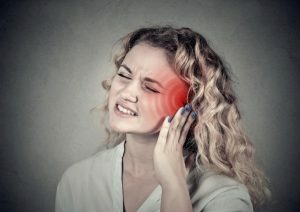 In some cases, the symptoms of tinnitus can be caused (or worsened) by allergies and congestion in your nasal passages. Usually, the symptoms are an indication of advancing hearing loss. Regardless, the best thing to do is to take a hearing test as soon as you can. The sooner you go through the testing process, the sooner you’ll have access to your options, and the sooner you’ll be on your way to better hearing. Vertigo which causes a sensation of dizziness or motion can also cause you to lose your balance and increases your chances of falling especially for those over the age of 65. It’s no coincidence that many people belonging to that age group are also experiencing hearing loss since vertigo is caused by a disease affecting your inner ear. Your inner ear function is what helps you stay upright and helps with your balance. Can vertigo put you or a loved one at risk? If you or someone close to you is experiencing vertigo episodes, reach out to us and get your hearing evaluated. We’ll be able to offer you a professional diagnosis followed by a specialized treatment plan with the goal of maintaining your balance and avoiding injury. Is it possible that your hearing loss is caused by earwax? Some folks make more earwax than others. Over time, wax can build up in your ear canal which can harden and become stuck, even if you’ve attempted to clean it out as much as possible. It’s also well known by now that cleaning your ears with swabs can end up pushing the wax in deeper. You can’t necessarily feel the buildup, but it can lead to temporary hearing loss. Call us to schedule a visit. We’ll check your ears and can unplug them for you right away.